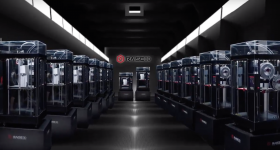 Here we are again with our Top 10 lists of 3D printers. This time we ventured into the exceedingly complex world of 3D bioprinting. Most commercially available 3D bioprinters are based on some proprietary version of a basic syringe/pressure-based extrusion of both paste-like polymeric substances and hydrogels (also known as bioinks in certain cases), which are basically gel-like substances containing high quantities of water and living cells. There are several variations and alternatives, but not always are these differences made public by the companies behind them. Once again, we based our classification on entirely subjective evaluations based on how well known the 3D bioprinter is and how often we run into it being used for bioengineering and biomaterials research or other applications. Similarly, the list is actually a list of all the bioprinters (and bioprinting devices) that we are aware of and that are either commercially available or that are used to make commercial bioproducts. The list does not include two very fascinating projects which have not yet arrived on the market such as the ultra low-cost and open source machine by BioBots or the Printalive skin 3D printer which won a recent James Dyson Award. The list also does not take into consideration the many University-developed 3D printers which are used internally and only for research. This is one of the widest areas of development. 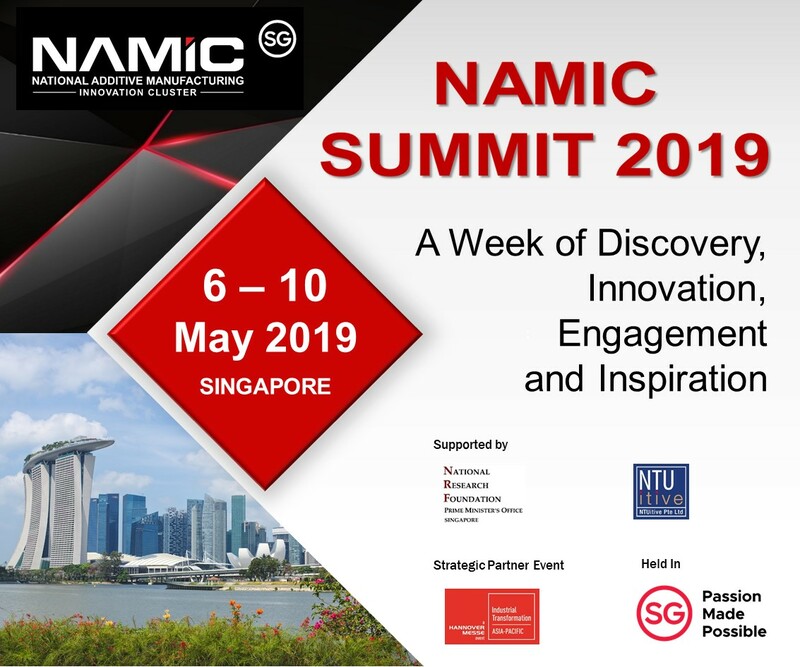 For example South Korea’s Postech University’s Intelligent Mankfacturing Systems Lab (IMS) has developed its own 3D bioprinters which use several different technologies including stereolithography-based and deposition based technologies. 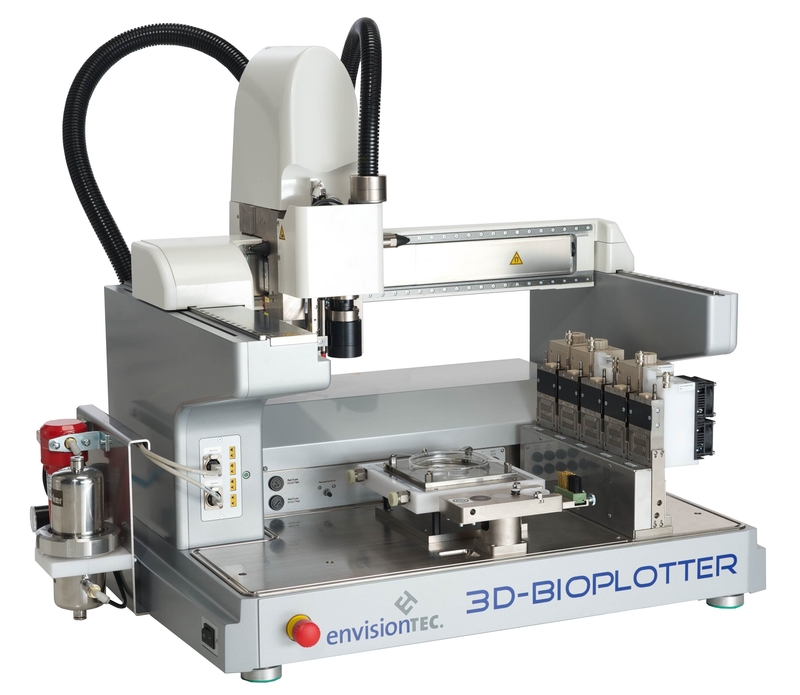 EnvisionTEC’s 3D Bioplotter system occupies the leading spot in our top 10 because it is the only bioprinter made by a company that is already a leader in the 3D printing industry. It is basically a 3D bioprinter that works through a relatively simple extrusion process, invented by the Freiburg Materials Research Centre in Germany. Like any other 3D printer it transforms CAD models into physical objects, only in the case of this machine, Computer Aided Tissue Engineering is converted from 3D models and patient CT data into a physical 3D scaffold, with a designed and defined outer form and an open inner structure. 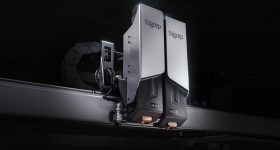 The 3D Bioplotter is available in two versions, with the high-end, quintuple-extruder Manufacturer Edition and a more accessible triple-extruder Developer Edition for academic and research institutions. The 3D Bioplotter is used by researchers for fabricating scaffolds using the widest range of materials, from soft hydrogels over polymer melts up to hard ceramics and metals. 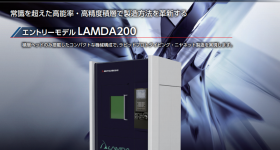 This machine is specially designed for work in sterile environments in a laminar flowbox, a requirement of biofabrication, for example, when using alginate cell suspensions for scaffold construction. Organovo’s NovoGen MMX 3D bioprinter is probably the most well known in and outside of the 3D printing industry because the San Diego-based company is the only pure-play 3D bioprinting company to have gone public (and to have taken a ride on the stock market roller coaster these past couple of years). The reason why it is the second in out list is because Organovo does not sell its NovoGen MMX technology, but only uses it to produce bioficial tissues, which it sells to large drug manufacturers in order for them to test their new products more efficiently. Named Best Invention of 2010 by TIME Magazine, Organovo’s bioprinter works by taking cells from a research cell line, a patient, or other sources and growing them in a culture until enough cells are present. The cells are then collected and specially incubated in order to form bioink, consisting of cells and the building blocks to form a functional organ system in vitro. This is the beginning stage of solid tissue formation. The cell mixture is then loaded into a cartridge, which is placed into the printer. With a computer-programmed script, the printer deposits the tissue into a desired shape. The printed tissue is incubated for 48 hours or more to allow it to mature. The company has already begun selling 3D printed liver cells and has produced kidney tissue and is in the process of developing skin tissue through a partnership with L’Oreal. 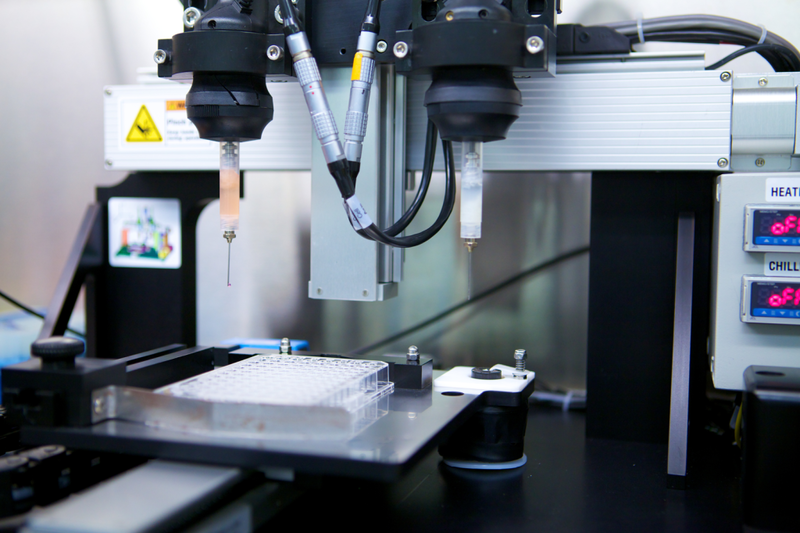 Along with agreements with pharmaceutical giant Merck and Yale University, Organovo has also signed a partnership with Autodesk for the development of more efficient CAD software specifically for 3D bioprinting. 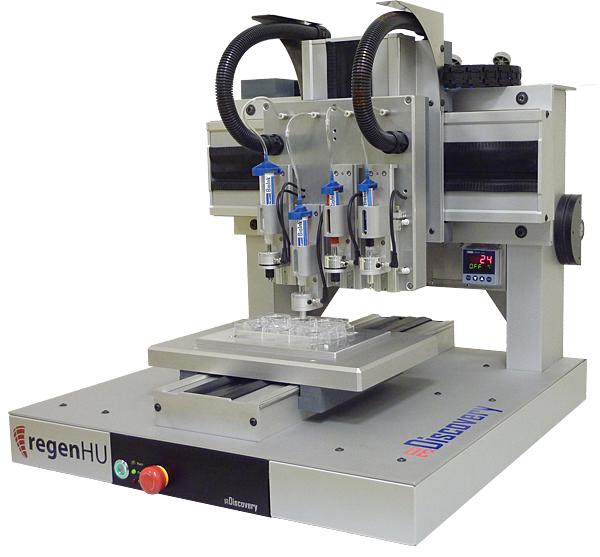 Switzerland-based RegenHU is probably one of the companies most focused on the the commercial aspect of 3D bioprinters and bioprinting consumables. It provides two cutting-edge bioprinting solutions that work by combining multiple extracellular matrix materials, hydrogels, cells, and bioactives within a three-dimensional spatially-controlled environment, enabling highly dynamic networks of proteins and signal transduction pathways in tissues, cell-cell and cell-extracellular matrix interactions. The high-end BioFactory was developed to allow researchers to pattern cells, biomolecules, and a range of soft and rigid materials in desirable 3D composite structures in order to mimic biomimetic tissue models. The more affordable 3DDiscovery system was configured as a cost-effective 3D bioprinting platform to explore the potential of 3D tissue engineering. RegenHU also manufactures and sells biomaterials for use with its 3D bioprinters. BioInk is a chemically-defined hydrogel to support growth of different cell types. It allows cell adhesion, mimics the natural extracellular matrix, and is biodegradable. OsteoInk is a ready-to-use calcium phosphate paste, close to the chemical composition of human bone, for structural engineering. 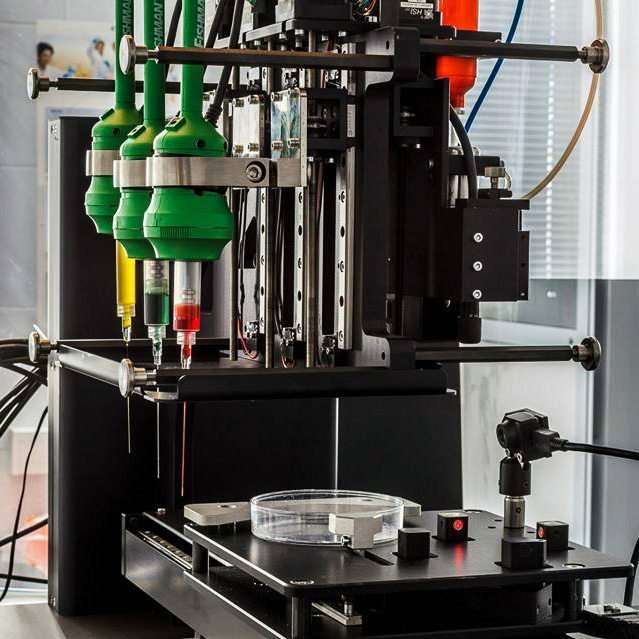 Like Organovo’s NovoGen MMX, the FABION 3D bioprinter was developed by Skolkovo, Russia-based 3D Bioprinting Solutions (3D Bio) exclusively for internal use. The main difference, other than the fact that one is based in the US and the other in Russia, is that 3D Bio has clearly stated the objective of 3D printing a functional and implantable human organ in the near future. 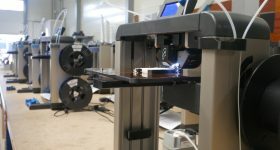 The company already 3D printed functional thyroids for implantation in mice, and, although that may mean very little, the team behind it has accurately studied all fields of 3D bioprinting research in order to create a system that can implement several different 3D bioprinting processes (including photoactive and electromagnetic) in one machine. 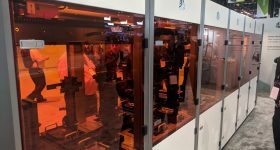 Perhaps one of the clearest examples of how the bioprinting market is running on parallel lines as the tradutional 3D printing market, BioBots was an SXSW finalist startup and its first product is a high resolution, desktop 3D bioprinter that builds functional three-dimensional, living tissue. It uses a pressure extrusion system printing with a bevy of hydrogels, such as agarose, collagen, alginate, and polyethylene glycol. Upon extrusion, blue light and UV light technology are used to cure the material without damaging any living cells. 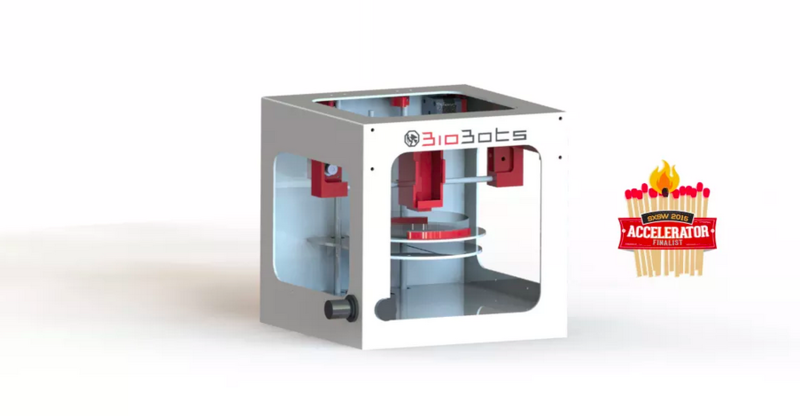 BioBots launched selective Beta program about 9 months ago, for the Beta version of the BioBot 1 3D Printer. The Beta program – now closed – was extended to top researchers across the world and the company’s CEO, Danny Cabrera revealed that they have already sold devices to MIT, Penn, Stanford, Karolinska, Columbia and many others. The new and improved BioBot 1 is officially launching on the commercial market next September 8th at the TERMIS world congress. The price of the new devices is $10,000, and BioBots has begun taking pre-orders. The INKREDIBLE 3D printer even looks like a standard FFF desktop 3D printer. 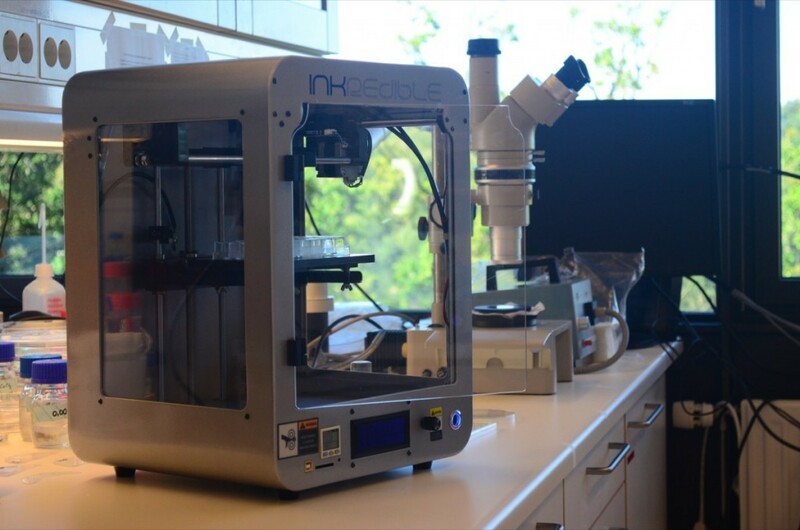 It employs a pneumatic extrusion 3D printing process which is known to be less harmful to the cells and like several other commercial bioprinters it comes in two versions, the INKREDIBLE and the INKREDIBLE+. Both have standard dual extrusion, with the more expensive model offering other advanced research features and coming in at $9,000. 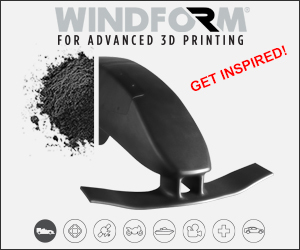 There are three features that make this 3D printer truly incredible. First of all, it has clean chamber technology. This means that the chamber inside which the bioprinting takes place is an almost sterile, CGMP environment. The second feature is the standard dual extrusion, which has been introduced in order to enable all models to bioprint skin tissue. The third feature is the printer’s digital pressure sensors. Materials: Collagen, Gelatin, Alginates, Chitosan and more. One of the most amazing features of the Ourobotics Revolution 3D bioprinter is the price, set at €12,500. 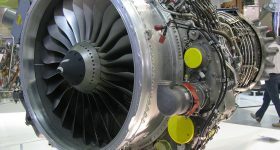 Co-founders Stephen Gray and Jemma Redmond intend to offer a limited number of these machines in order to get feedback to build the next version. The current model is reconfigurable so that different bioprinting setups can be run from the printer in future, which means that it can be upgraded and expanded. It also comes with a heated enclosure to keep cells alive. Current possible applications range from Human tissue, Pharmaceuticals, Food, Synthetic Biology, Electronics, Batteries, and even Textiles as the machine can print with just about every gel-like substance including Collagen, Gelatin, Alginates, Chitosan and more. When I first wrote about the BioAssemblyBot, I defined assembly robots as the future of 3D bioprinting or, in this case, bioassembly, and I was not the only one. In fact, the company that manufactures the machine, Advanced Solutions, calls it “the next stage of evolution in 3D printing technology”, listing all of its possible applications for cell systems and assays, experimental tissue models, organ models and microfluidic platforms. The BioAssemblyBot is based on TSIM, an intuitive software tool that empowers doctors and scientists to design, visualize, simulate, and analyze 3D computer models of complex tissue structures. The data is then sent to the workstation for printing. 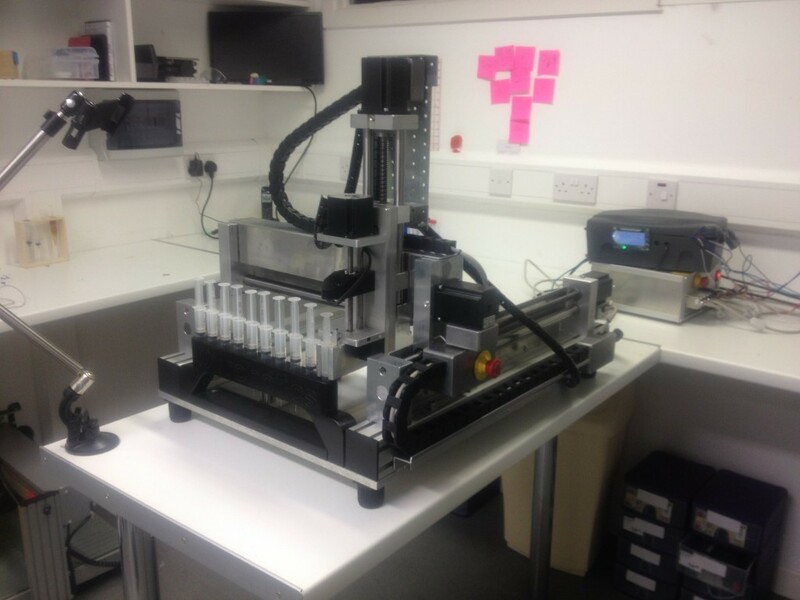 Utilizing a six-axis robotic arm, the BioAssemblyBot precisely builds 3D tissue structures and models, automatically switching between up to 8 independent syringe barrels. 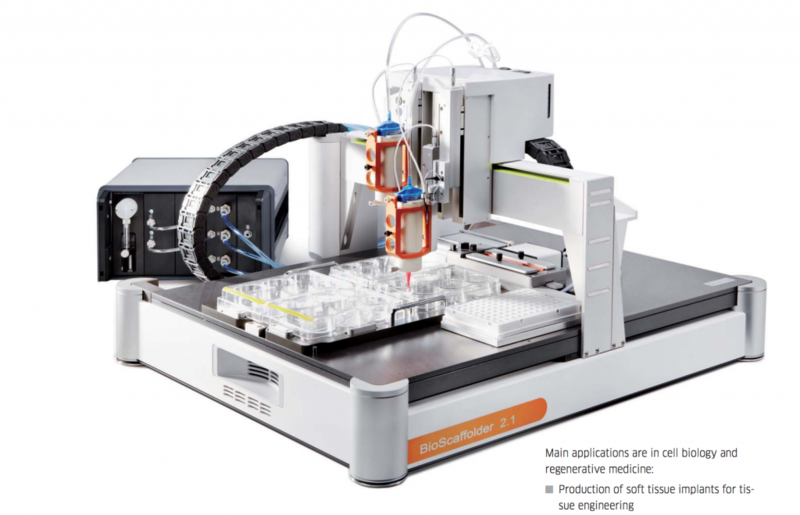 The BioScaffolder 2.1 is a modular instrument platform with up to four independent z-axes for running several dispensing tools. 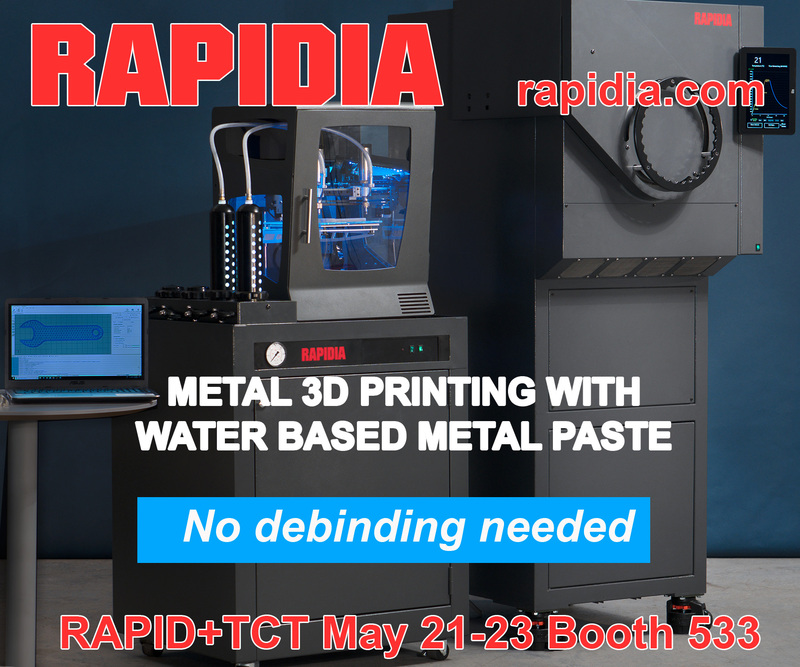 It provides pressure-driven 3D printing as well as piezoelectric Nanolitre pipetting on the same instrument, which means that it is able to 3D print a scaffold and automatically apply the cellular materials to it by pipetting up to 384 sample species on parts of a scaffold structure. The print head of the Bioscaffolder 2.1 operates up to three pneumatic dispense cartridges for printing high-viscous paste, along with a piezoelectric Nanoliter pipetting unit. Each tool is controlled by separate z-stepper motors. Individual configurations starting with a single axis pneumatic dispenser are available, as well as several upgrades. 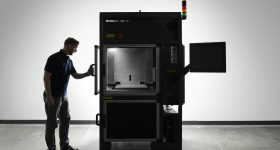 Welsh company 3Dynamic Systems Ltd (3DS) developed two new, relatively low-cost additive manufacturing systems capable of depositing a range of biologically active and biologically compatible materials. The company is working toward 3D transplantable bone and complex tissue constructs on demand and successfully engineered a suitable bone composite and a 3D bioprinting technology to make high complexity tissue structures. These have been determined to be optimum materials for producing reliable extra cellular matrix-based tissues. 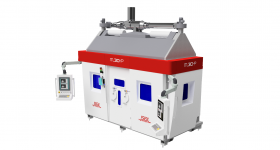 The 3Dynamic Alpha Series is a single extrusion bone tissue fabrication platform. The deposited material can be seeded with platelet-derived growth factor to create the right environment for tissue regeneration by recruiting stem cells that can produce bone and form a supportive structure, including blood vessels. 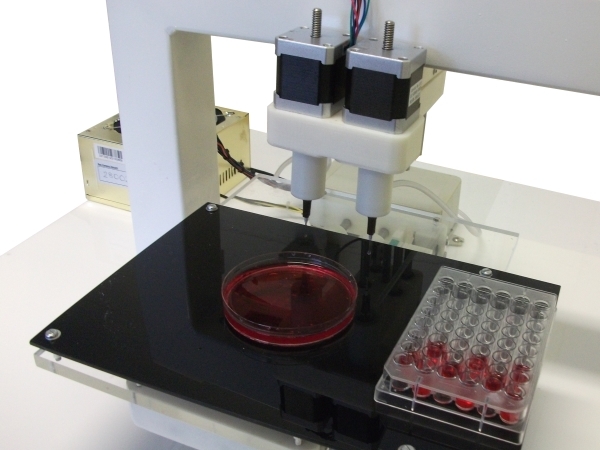 The Omega Tissue Engineering Workstation is a dual extrusion 3D bioprinter used to generate heterogeneous tissues with a printable bioactive gel, protein growth factors. and scaffolds that mature into living tissue structures. 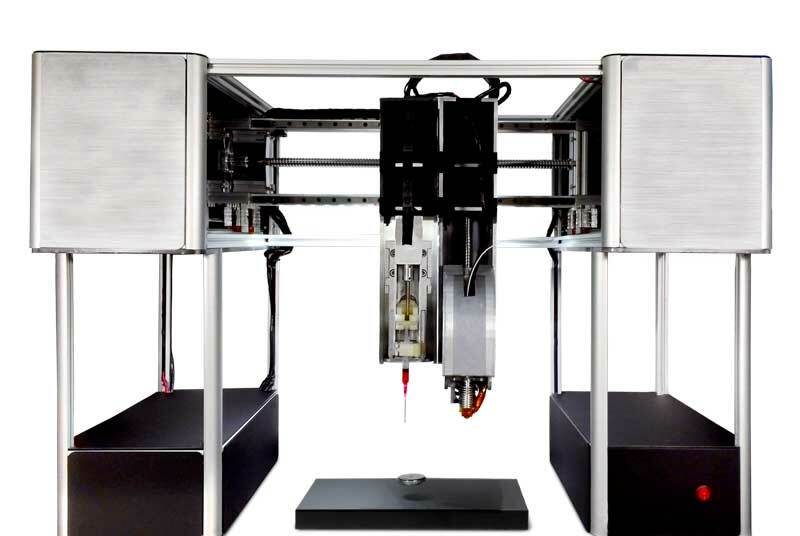 Bio3D Technologies’ third generation printer, the SYN^, is an advanced robotic 3D printing system suitable for any research and scientific application, such as printing of whole cells, bacteria, proteins, bio-gels, polymers, food materials etc. Bio3D also produces the entry-level Bio3D Explorer system for researchers and developers. Vancouver-based Aspect Biosystems’ platform technology constitutes an entirely new way of 3D bioprinting, engineered specifically with the capacity to fabricate physiologically complex, living tissue on demand. 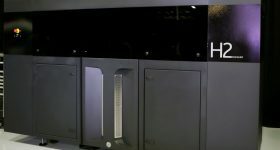 The company’s sophisticated Lab-on-a-printer technology enables unprecedented control over biomaterial composition and structure during tissue fabrication. Aspect claims they are able to develop advanced 3D tissue models much faster and using a wide spectrum of different cells, biomaterials, and growth factors than with other bioprinting technologies. This includes macro-scale 3D structures that incorporate intricate micro-level details to generate architecturally and functionally accurate human tissues. By enabling the user to program the structure, material composition, and printing process in software, Aspect has enabled the production of a wide variety of potential living structures. In magnetic levitation, cells are magnetized with NanoShuttle-PL (which consists of gold, iron oxide, and poly-L-lysine and magnetizes cells by electrostatically attaching to cell membranes) through overnight incubation and dispensed into a cell-repellent, multiwell plate, where they are levitated off the bottom of the dish by a magnet above the plate. In levitating cells off the bottom of a multiwell plate, the magnetic forces work as an invisible scaffold that rapidly aggregates cells, and induces cell-cell interactions and ECM synthesis. The 3D culture is formed without any artificial substrate or specialized media or equipment and can be cultured long-term. 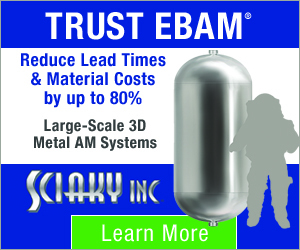 Additionally, adding and removing solutions is made easy by the use of magnets to hold down 3D cultures when removing solutions, limiting culture loss. 3D cultures can also be picked up and transferred between vessels using magnetic tools such as the MagPen. If you are in the market for a serious 3D bioprinter now, though, this might help you focus in on what you are looking for. If you are working on developing your own system, these are some of the top competitors you will be facing. And, who knows, maybe in twenty years, you’ll have something like you see in the animated .gif from The Fifth Element posted above. *This article was modified on August 26th to include the BioBot 1 Bioprinter and on August 27th to include new details about the BioBots Beta program and official launch date.